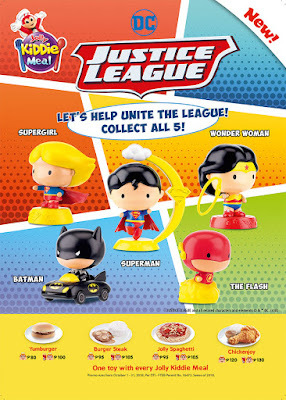 Young ones can enjoy hours of awesome superhero adventures with the latest Jolly Kiddie Meal toys, the DC Justice League! Jolly kids can help unite the league by collecting Superman, Batman, Wonder Woman, The Flash, and Supergirl to fight evil forces and save the world. With their super strengths and abilities, powerful gadgets, lightning fast speed, and special powers, the DC Justice League superheroes can truly make playtime more exciting for little heroes. Let the Man of Steel float in the air as he watches over the city by assembling the base and placing Superman on top. Kids can let the Caped Crusader fight criminals by simply inserting discs inside the Batmobile and pressing down on Batman’s head to shoot the discs. The Flash can also run after escaped enemies while leaving a lightning trail behind. Simply hold the base firmly and push him forward to see the base light up as he runs. Trust Wonder Woman to round up the bad guys without a sweat. Just insert the lasso into her hand and rotate the dial at her back to watch her spin the magical rope. Supergirl’s powerful punch is enough to knock out even the toughest criminals. Simply slide the lever at her back and release it to perform her powerful punch. Collect the five DC Justice League superheroes with every purchase of a Yumburger (P80), Yumburger Meal with Drink (P100), Jolly Spaghetti (P95), Jolly Spaghetti Meal with Drink (P105), 1-piece Burger Steak (P95), 1-piece Burger Steak Meal with Drink (P105), 1-piece Chickenjoy with rice (P120), or 1-piece Chickenjoy Meal with Drink (P135), each with its own Jolly Joy Box. Hurry and help unite the league with the DC Justice League toys, available until October 31. Visit your nearest Jollibee branch to collect all five superheroes!